This contemporary Garden Room in Bristol was designed by our customer who was looking for a outdoor retreat. Our end to end service includes installation and delivery by our specialist Team of Installers, as part of our impeccable service. 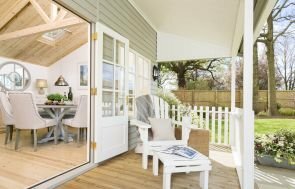 This Garden room measures 3.0m x 4.8m in size and is the perfect environment for the customers' outdoor retreat. The exterior shiplap cladding was coated in the Lizard tone from our Valtti paint system. This offers the best possible protection for timber and it is extremely durable, as well as being low maintenance providing the building with longevity. The interior features a painted matchboard lining, insulated roof, walls and floor and to improve comfort, an electrical pack with a heater, allowing for comfortable use all year round. 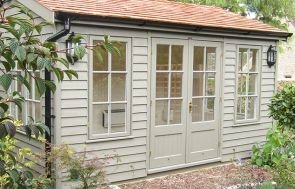 If you would like to know more about our Garden Rooms, you can visit your local Show Centre in Newbury, which has a variety of different size and style display buildings including Garden Rooms. Alternatively, you can call one of our experts on 01760 444229. With full insulation and electrics, these buildings are designed to offer year-round comfort and provides the perfect place for relaxation, hobbies, socialising and more.